Free Bundle [Freeware], Other effects bundle or multi-effect from Nomad Factory. mooseherman's review"Free plugins! Woo hoo!" This is a free plug-in bundle made by Nomad Factory. They are a high-quality developer of plug-ins and they tend to be uniformly awesome. These are some of the first that I used, as they were free and too easy to pass up. You simply download them from the Nomad Factory website. There weren't any compatibility issues, these are basically going to work well with any version of Pro Tools that you download. I have no experience using them in other DAWs so I can't speak for how well they work in that respect. I haven't really had much need for a manual as these are basic plugin effects. I've never had an issue with these plugins. They don't demand a whole lot of processing power, and therefore they aren't exactly difficult to manage from the computer's standpoint. I am running it on my Macbook pro with 4 GB of RAM so I haven't had many problems at all, really. It's been a fast, active response. These have some pretty cool plug-ins. There are three total, a phase shifter, a tremolo, and a sweeper. Basically all similar effects, and they also have similar interfaces. They are pretty easy to use. While they are cool, I don't always have much practical application for them, and I really just tend to mess around with them as experiments. This is probably because I don't do a lot of music that would require such effects, or if I did, I'd probably use a pedal or something (hey, I'm a guitar player and I love my pedals). However, they are free, so I can't exactly be too harsh on them with the grade. I'd definitely recommend that just about anybody get them, as there isn't really any way you can go wrong. 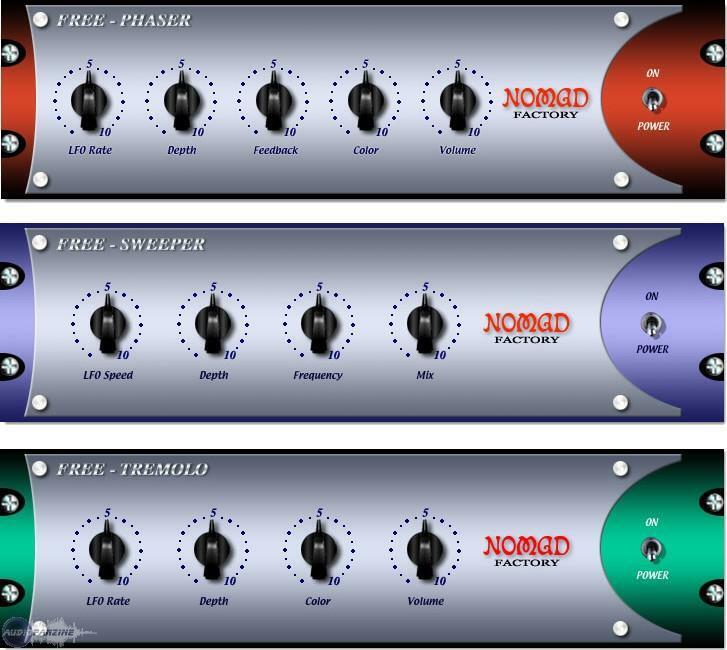 The Nomad Factory Free Bundle was quick and easy to install, and I had the plug-ins available for use minutes after downloading them from the Nomad Factory website. I had no compatibility issues with these plug-ins, as they provide them for all types of configurations. 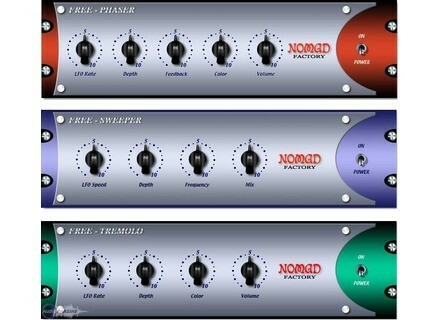 The bundle has three freeware plug-ins – a phase shifter, a sweeper, and a tremolo. All have the same basic layout, each with four or five knobs to control different parameters. They are all super easy to use and I never had any problems with installation or otherwise. I don’t have a manual for this bundle, but these are some of the easiest plug-ins in the world to use and you shouldn’t need a manual. Currently, I am running the Nomad Factory Free Bundle on a Mac Book Pro that has a 2.2 Ghz Intel Core 2 Duo processor and 4 GB of RAM. I run these plug-ins in Pro Tools LE 7.4 that runs off of a Digi 002R audio interface. These plug-ins have always run smoothly within this configuration, and I have never reached a point where these were slowing down my computer. I have been able to run a few of these at once without any issues, although I don’t typically use a bunch of them at once. Overall, the Nomad Factory Free Bundle runs smoothly and efficiently within my configuration. I have been using the Nomad Factory Free Bundle suite of plug-ins for about three or four years. I downloaded them from the Nomad Factory website for free and I’m happy to have them in my arsenal. You can really complain about free plug-ins, so I won’t! These are very good sounding plug-ins, and show you what a company like Nomad Factory is capable of. While I like the tremolo plug-in the best, all three are great sounding and no home or professional studio owner should be without them, as they are free!